Whether you’re looking to upgrade your phones to the latest and greatest IP sets or just looking for additional phones to add onto your existing system, you’ve come to the right place! Network Craze offers an expansive inventory of both new and refurbished phones to outfit whatever phone system you need to support. Don’t let some manufacturer decide when you need to upgrade your phones. The decision is yours, and yours alone. We can help you with all of your needs—whether it’s finding ways to maintain your current phone system, or planning the installation of a new system entirely. With both new and pre-owned voice equipment in our inventory, the possibilities are virtually limitless. Analog, Digital or VoIP? 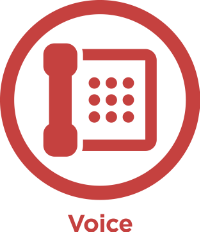 We’ve got you covered– Not all businesses are ready to make the jump to VoIP phone systems, and that’s okay! If you’re looking to maintain your traditional analog or digital based voice system, we can provide you with the equipment you’re looking for. We sell everything from legacy phones and PBX components to the newest IP phones and gateways. Either way, you can trust that you’ll get fast delivery, industry leading pricing, and continued product support through our Advance Replacement Lifetime Warranty on all new and refurbished products. Find your discontinued voice products here– Are you concerned because your favorite manufacturer just announced that it is discontinuing your favorite phone system? Don’t be. We offer support for discontinued products, meaning you can receive ongoing maintenance and replacement parts long after a product reaches its end of life stage. So if you’re not ready to upgrade to a different system, you can keep using the one that you have while still receiving the support you need to keep it running optimally. Fast delivery –If you are on a deadline or simply can’t wait to receive your new voice equipment, that’s not a problem. We can have your products to you in a matter of hours—not days. Phone Trade-In–Most companies don’t have the warehouse space to store decommissioned phones once they’re been upgraded. We can help! We offer trade-in credits off the price of the new phones you’re looking to purchase and will take your older phones back as soon as you take them out. Already have decommissioned phones from past upgrades? Send us your list as we may be able to offer credit on account towards future purchases. Best warranty –What good is a warranty if it’s not a lifetime replacement warranty? All of our equipment is backed by a lifetime warranty that allows you to send items back to us for replacement at no additional cost. I was concerned about having refurbished and new product mixed in my new phone system. My concerns quickly went away. The phone system is working great and the employees can’t even tell which phones are refurbished. The money saved allowed me to upgrade additional phones.